Tip Top Atomic Shop is Milwaukee Wisconsin's only one source Rockabilly store. We specialize in 40's, 50's and 60's vintage clothing. We also carry atomic modern Eames Era household furnishings from the 40's 50's 60's as well as the best in new reproduction retro styled lounge shirts and pinup girl dresses, bowling shirts, and hawaiian attire.We are an authorized Heywood Wakefield distributor. 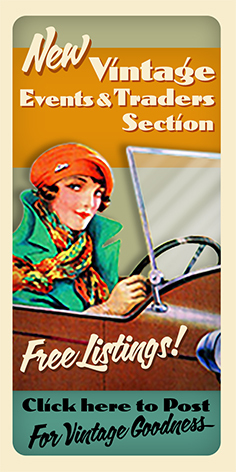 Lots of collectibles, antiques and jewerly. If you can't make it to our store in person then be sure to vist the online store or eBay and pick up some crazy cool retro inspired household goodies and great vintage & rockabilly clothing.